Is there such a thing as a normal day anymore? Today certainly was not. But I did finish the double-loop-in-loop chain and turn it into a bracelet by adding a clasp. 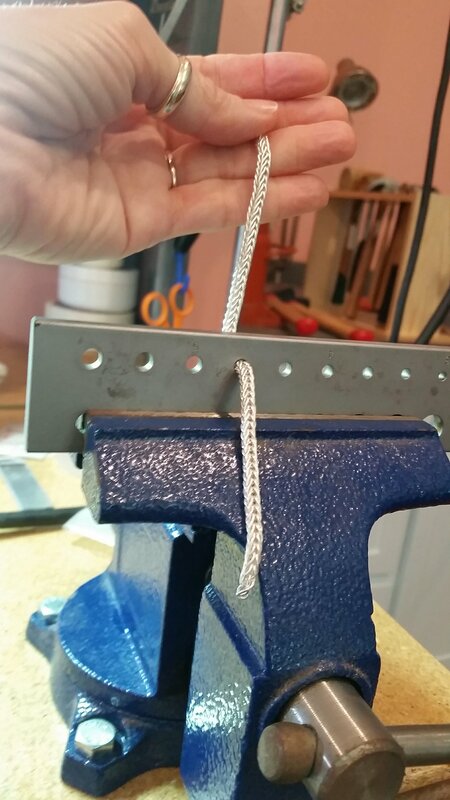 Once this type of chain is woven, it must be annealed and pulled through a drawplate to even it out. Today’s picture shows the final step, as the chain is being pulled through its third and final hole, each successively smaller. I then soldered on the clasp, soaked it in hot vinegar to remove all the black from the torch, and tumbled it to make it nice & shiny. The tumbling also adds suppleness & strength. This entry was posted in Art, Metal and tagged 100 Days of Metal, Bracelets, Chains, Fine Silver, Jewelry, Silver. Bookmark the permalink.